Surprise your special ones by sending this Signature Chocolate Basket Hamper that will welcome into their hearts the breeze of love and joy. 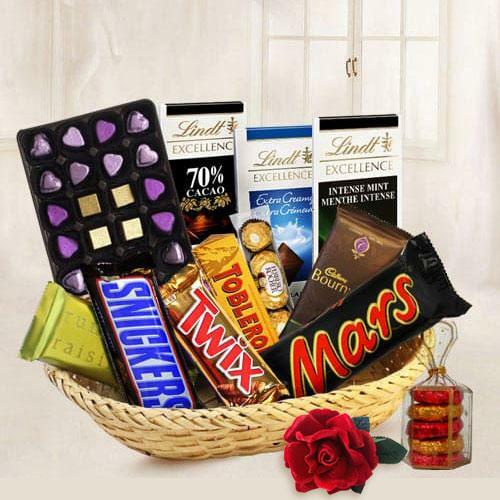 This enormous Basket is composed of 18 Pcs Homemade Assorted Chocolates, Lindt Excellence 70% Cocoa, Lindt Excellence Mint, Lindt Excellence Extra Creamy, Toblerone, Temptation, Twix, Snickers, Mars, 4 Pcs Ferrero Rocher and 100 gms Homemade Assorted Chocolates. Flowers Delivery Tanjore, Send sweets Kakinada, Wedding Cake Garmukteshwar, Diwali Mithai Varanasi, Send Flowers and Gifts to Buldhana, Online Shop Hapur, Flower to Puttur, New Year Flowers Chennai , Fresh Fruits Bareilly, Send Gift Hyderabad, Dry Fruits to Karauli, Birthday Delivery Udupi, Sending to Ramgarh, Flower shop Hyderabad, Satna Online Cake Delivery.